The Class B (LNER N8) was T.W. Worsdell's first completely new design for the North Eastern Railway (NER). By introducing a wheel arrangement with an extra trailing axle, he was able to produce a more powerful locomotive for hauling mineral trains. The first ten locomotives were built in 1886 with Joy valve gear and simple expansion. Two more locomotives were built in 1888 as a cost comparison. 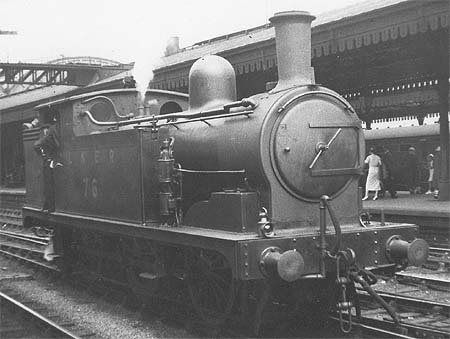 The first was a two-cylinder compound using the Worsdell-von Borries system, whilst the second was a conventional simple expansion locomotive. This appears to have been a success, and fifty more Class B compound locomotives were built over the next eighteen months. The simple expansion locomotives were classified B1. The Worsdell-von Borries compound system used an 18in diameter high pressure cylinder and a 26in diameter low pressure cylinder. Exhaust from the high pressure cylinder was fed into a large pipe in the smokebox that acted as a receiver before it was used in the low pressure cylinder. Starting when the high pressure cylinder was on dead centre posed a potential problem, and was solved with a driver-operated valve that allowed steam to pass directly into the low pressure cylinder. Compounding was never very popular in Britain, but its use was more attractive at the end of the 19th Century when expansion ratios were lower and superheating had not yet been introduced. The lower expansion ratio meant that there was only a small difference between the temperatures of the live and exhaust steam, allowing significant improvements in efficiency for a compound system. A significant disadvantage was that they were harder to start, which proved a problem when the N8s were used for increasing amounts of pick-up goods work. The Class B 0-6-2Ts were quickly followed by the Class C (LNER J21) locomotives of which large numbers were built with compound expansion. Over time the NER found that compounding was not living up to its promise. In the early 20th Century, Wilson Worsdell converted the Class B and Class C locomotives to simple expansion. This process started with the Class Cs, and the Class Bs were converted between 1902 and 1912. Rebuilds occurred only when new cylinders were required, resulting in a number of different cylinder and valve arrangements. The first three rebuilds employed 18x24in cylinders and Joy valve gear. Twelve compounds and one of the original simples were modified with 19x26in cylinders and piston valves operated by Stephenson's valve gear. Twenty one compounds and three simples were rebuilt with a hybrid using 19x24in cylinders, Stephenson's valve gear, and piston valves. This variation avoided the need for a new crank axle. This left fifteen compounds which were eventually rebuilt like the original three. Between 1918 and 1922, six of the Joy valve locomotives were rebuilt with 19x24in cylinders and piston valves with Stephenson valve gear. Shortly after these rebuilds, the NER recognised that superheating could produce a more effective increase to efficiency and economy. Hence between March 1915 and March 1927, thirty seven N8s were fitted with Schmidt superheaters. Six Joy valve gear locomotives, and all but six of the piston valve locomotives were fitted with superheaters. The same boiler type was used on the J21, J25, N9, and N10 locomotives; and boiler swaps were common. In 1930, the LNER decided that superheating the N8s was not justified due to cost and complexity. After this date, expired superheated boilers were replaced with saturated boilers. Two became saturated in 1932, one in 1938, eight between 1943 and 1945, and four Nationalisation (1948). Most of the post-1940 boilers were to Diagram 67A. Diagram 67A boilers were built in both saturated and superheated forms. Only six N8s received superheated Diagram 67A boilers, and five of these were second-hand from other locomotives. The N8s were built for medium distance goods and mineral trains, and were quickly put to work on these duties. In the late 19th Century, their most notable work was between West Auckland and Tebay over Stainmore Summit. The N8s replaced Stockton & Darlington designed long-boiler 0-6-0 engines on this 101 mile round trip. As would be expected, their coal consumption was much better than the long-boiler 0-6-0s. During trials, the compound N8s also proved superior to the simple N8s, although this dropped significantly for short runs and shunting. Another early working involved mineral trains from sidings to port, e.g. Stella Gill to Tyne Dock; Bishop Auckland to Sunderland; and Selby to Hull. Between 1894 and 1909, large numbers of J24s, J25s, and J26s were built, displacing the N8s to local and trip goods workings. A third of the N8s were allocated to the Hull area for these duties. The N8s were quickly recognised as being very suitable for passenger branch services, and continuous brakes were fitted to many of the locomotives from 1899. Despite this, the continuously braked locomotives were mainly used for braked goods workings and empty coach workings, rather than actual passenger services. It was only after Grouping (1923) that they would be often used on the heavier branch passenger workings. The first withdrawal occurred in July 1929. Withdrawals were moderately quick, and only 35 were in service by 1938. Steam-braked N8s tended to be withdrawn first, probably because the continuously braked engines were more useful. At 1938, the allocation was: Dairycoates (11), Selby (4), Neville Hill (2), Starbeck (2), York (2), West Hartlepool (2), Waskerley (3), Consett (1), Borough Gardens (4), and Tweedmouth (3). Thirty N8s survived into Nationalisation (1948), and were allocated to Dairycoates (20), Heaton (5), Tyne Dock (2), Consett (2), and Sunderland (1). The last N8 to be withdrawn was from Tyne Dock in October 1956. Cylinders (x2): (inside) 19x24in./19x26in. 19x24in./19x26in. Heating Surface: Total: 1133 sq.ft. 1041.5 sq.ft. Firebox: 108 sq.ft. 108 sq.ft. Grate Area: 17.2 sq.ft. 17.2 sq.ft. The last N8 was withdrawn in 1956, and none survived into preservation. London Road Models, Nu-Cast, and Alexander Models sell 4mm scale kits of the N8. Gladiator sell a (ex-Fourtrack) kit of the N8 for 7mm scale (O gauge). Thank you to the Rosewarne family for the photograph of LNER No. 76.